An antique farm bell attached next to your back door is an accessory that is sure to cause waves of nostalgia in almost everyone who sees it. A century ago, long before cell phones, farmers' wives used these bells to call the family into the house for a meal. The bell's tone would echo throughout the fields and could be heard several acres away. Bead line - a raised line around the bell which is both decorative and functional. Clapper - the small part that hangs inside the bell and strikes the sides when rung. Crown - the piece at the top of the bell that allows it to be hung from a chain or rope. Head - the top of the bell where the crown attaches and the shoulders begin. Lip - the edge around the mouth of the bell, often decorative. Mouth - the open part of the bell on the bottom. Shoulder - found just below the head, this is the upper, curved part of the bell. Sound ring - the area between the bead line and the lip of the bell. Waist - the center of the bell where it begins to flare out into the traditional bell shape. Yoke - The piece that the bell attaches to. Bellfounding dates to the fourth or fifth century in Europe. Some of the first farm bells have been found on the top of Scandinavian barns where they were rung to call the farmers in from the fields at the end of the day. Traditionally bells were made of a special bronze, consisting of about 23% tin. This alloy is known as bell metal and gives the best tones. The bell would be cast, mouth down, in a special two part mold. The mold would be buried in a casting pit and then the hot bell metal would be poured into the mold and cooled. Today bells are most often cast in two parts and then soldered together. Bells were used for many things in the past. There were church bells, fire bells, and school bells, as well as farm bells. It can be difficult to identify one from another if you are not an experienced bell collector. Size is one of the important factors. Church bells were most often very large and placed in the bell tower of the church. Fire bells were often 30 inches or more in diameter. School bells usually were 20 to 30 inches. Farm bells were often 10 to 20 inches because the sound did not have to travel as far. 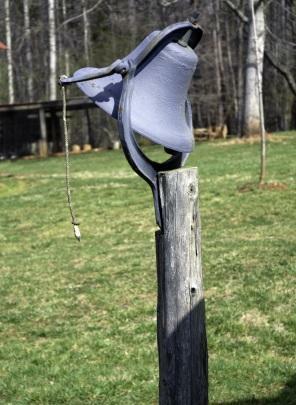 It is easy to find a replica farm bell. It can even look very old. However, these replica bells are not worth much at all and it is important to be able to identify the antique from the reproduction if you don't want to end up with an expensive imitation. The edges of the bell will have become soft and irregular over time. The edges will show heavy wear and the rest of the bell will also look worn and seasoned. Antique bells will not have a casting or parting line. The new bells are typically cast in two pieces whereas antique farm bells were cast as one piece. Once you find a bell you love you may want to clean it if it has become very tarnished. It is important that the bell be cleaned without marring the patina that has built up over so many years of use. Use a brass cleaner like Brasso and test it on an inner edge of the bell where it won't be apparent if there is a problem. Once the bell is clean, a regular dusting with a soft cloth should keep it in perfect condition. Finding an old farm bell is often a matter of luck. You may find one at the local thrift shop or a garage sale quite inexpensively or you may only be able to locate one at the local antique store. Some of the ease of finding a farm bell will depend on where you live. They may be easier to find in rural areas. It is a good idea to try to find one locally because of the weight and the cost of shipping. Ask a few antiques dealers in your area to keep an eye out for what you are looking for. If you can't find what you want in your area then you can try the following online sites. Be sure to read the fine print, make sure you understand the return policy and guarantees, and check into the cost of shipping. If you have questions be sure to ask them before you buy. eBay is always a great place to find almost anything you want. There are plenty of farm bells but not all of them are antique so be careful. Newel Antiques carries a wide variety of antiques, including farm bells. Rubylane has a plethora of antiques of different types. Tias also carries an ever changing variety of antiques. You may need to check an antique store often. The antiques that they have change, sometimes at a rapid rate, and just because you don't see what you are looking for one day doesn't mean it won't be there the next. No matter where you choose to display your antique bell it is sure to add a touch of country warmth to your home. Farm bells are still a great way to call the kids in for the day no matter where you live. If you decide to keep your bell outside then ensure that it is protected as much as possible from the elements to help maintain a beautiful tone and excellent condition.